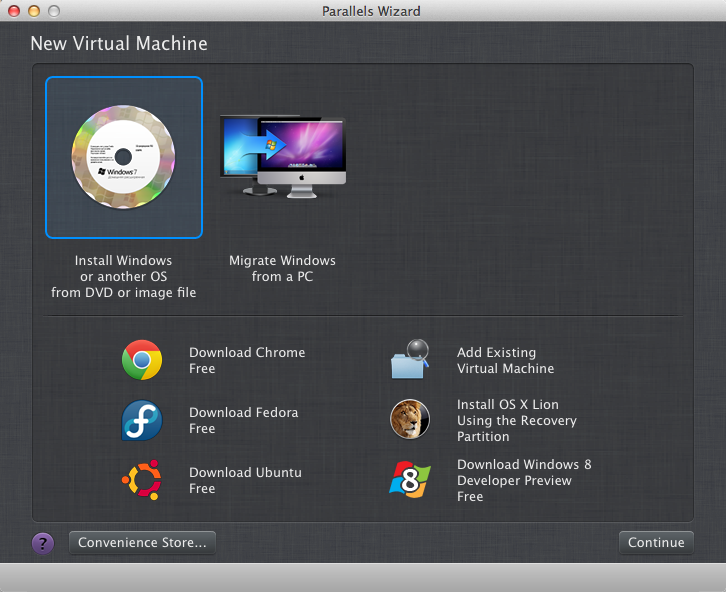 In this post I’ll describe my experience of converting a guest OS from VMWare Fusion 4 to Parallels. 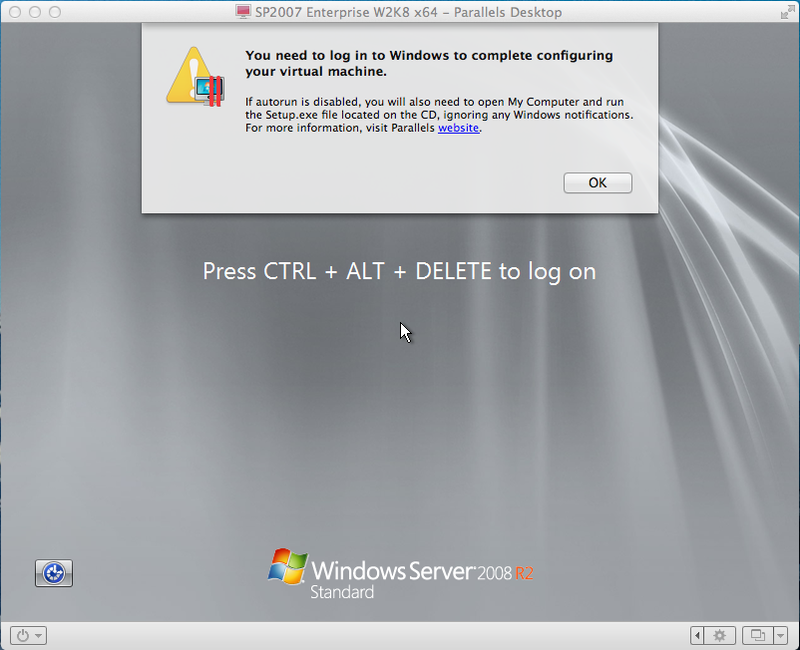 The VM in question is a Windows 2008 Server Std R2 x64, with SharePoint 2007 and related development tools installed. Also installed in the guest OS is the VMWare Tools service. The Parallels documentation doesn’t much describe the nitty gritty of this process, and simply says that you can convert existing virtual machines (from other vendors) to Parallels – so I decided to take them at their word. 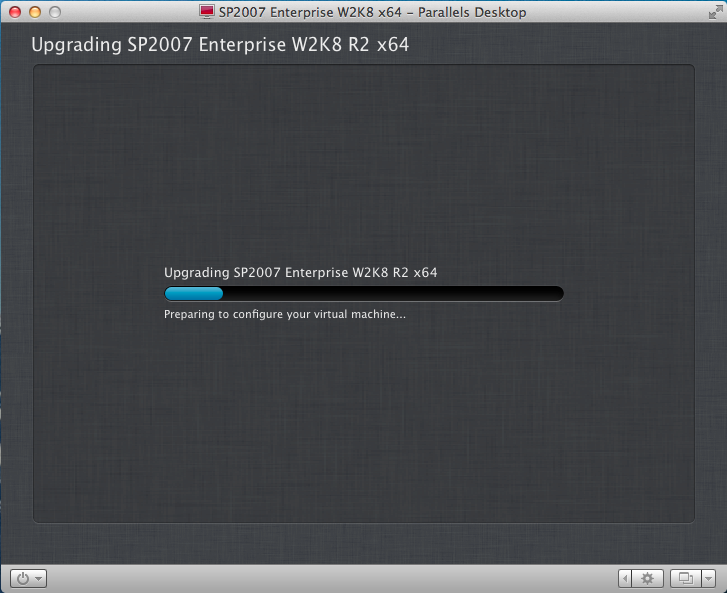 Converting the VMWare Virtual Machine. 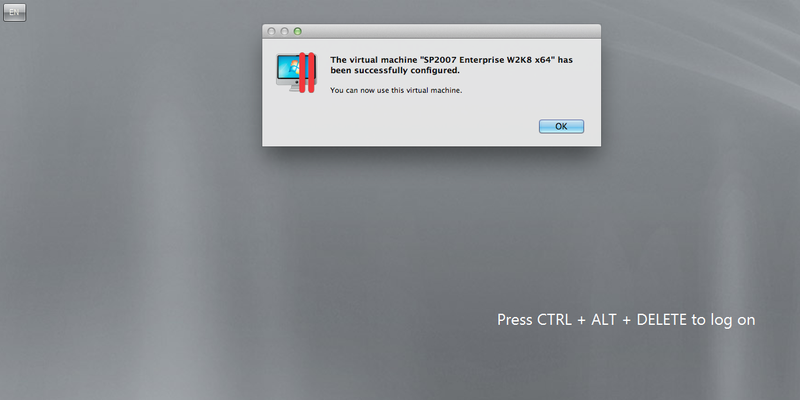 Click on “Add Existing Virtual Machine” and then click Continue. 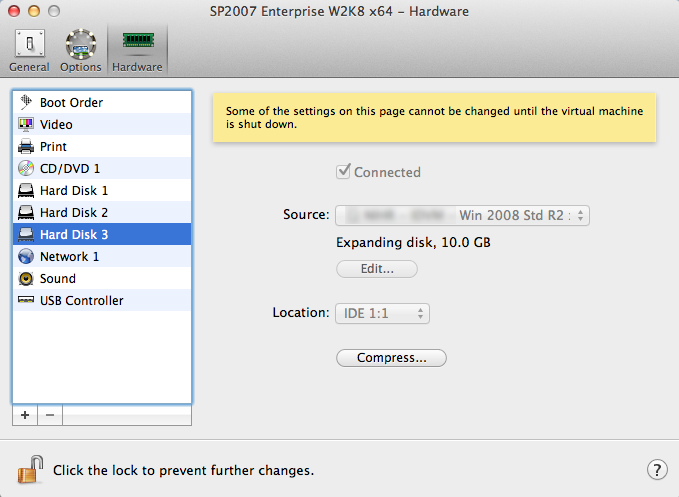 Next navigate to an existing VMWare virtual machine (.vmwarevm) and select it. 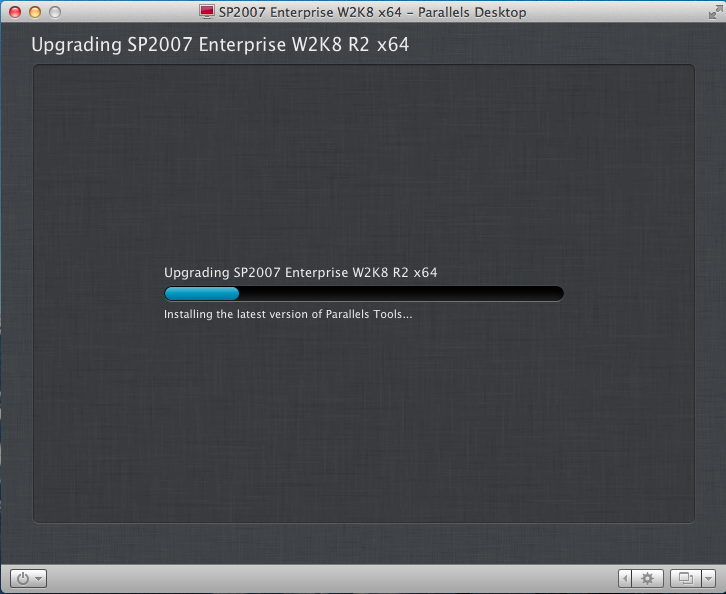 Parallels will now begin converting this virtual machine to a Parallels virtual machine. Note: converting an existing virtual machine does not affect or change the original virtual machine at all, effectively it copies the virtual hard drives, converts them and builds a Parallels virtual machine around the converted copies, incidently keeping most of the original virtual machines configuration settings such a network, memory etc. It’s also worth noting, and this surprised me somewhat, that Parallels converted all virtual hard drives from the original virtual machine and not just the 1st or system virtual hard drive. How long the conversion takes, depends on how many virtual hard drives you have and their size, but for me (with 3 VHDs @ 50GB, 30GB and 20GB) it took around an hour and a half. The message displayed here is quite important if you want to streamline your conversion process as during the next stages Parallels performs some upgrade processes which rely on AutoRun being enabled (which if it isn’t you’ll have to complete manually), most notable of which is installation of the Parallels Tools into the guest OS. Having completed the conversion, logged into the new virtual machine and kicked its tyres, I did a shutdown and then went into the virtual machine configuration to edit the sizes of the virtual hard drives, I made the system drive bigger and reduced the sizes of the 2 additional virtual hard drives. Once all the conversion and VHD editing shenanegans was over the (now Parallels) virtual machine works perfectly and seems as fast as if I’d built a new Parallels VM from scratch, the VMWare Tools service is still installed but obviously not running and so can be uninstalled. Surprisingly the guest Windows OS didn’t need reactivation either.